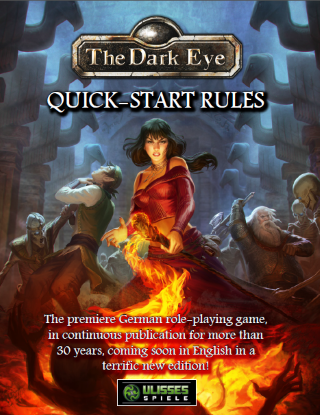 Welcome to The Dark Eye! 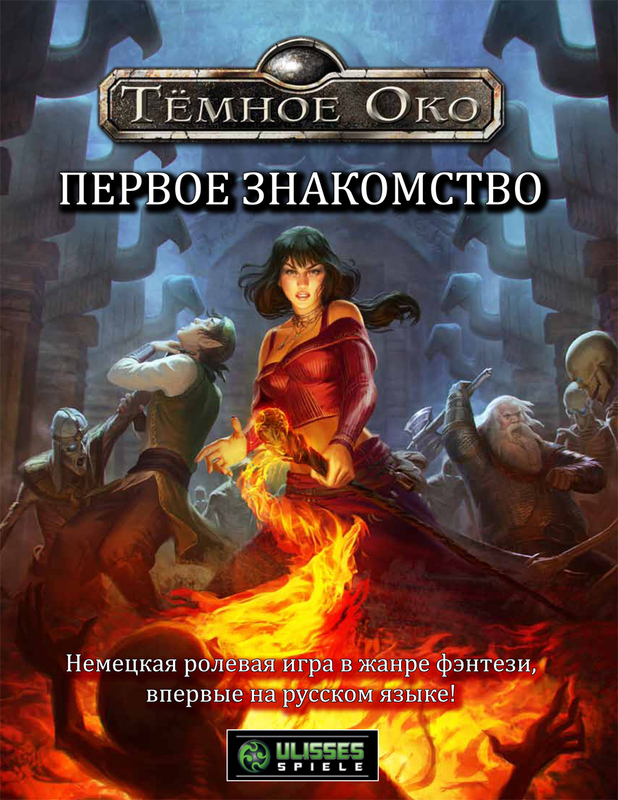 This pamphlet introduces you to the rules, and will give you an idea of how skill checks work, how to run combats, and which spells your hero might know. 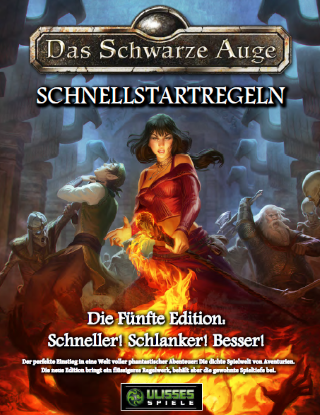 It provides everything you need to play your first scenario, which is included here. In The Dark Eye, heroes may choose from a wide variety of skills. Skills include proficiencies (such as Tracking or Plant Lore) and spells. Attributes are a hero’s basic framework and provide that hero’s characteristics. Every hero has eight attributes: Courage, Cunning, Intuition, Charisma, Dexterity, Agility, Constitution, and Strength. The higher your number, the better your hero is at that attribute. For every skill, skill group (physical, social, nature, knowledge, crafts), and spell, there are three attributes. You roll against these attributes in sequence. You can decide in which order you want to make your rolls, but you must determine against which attribute you roll before rolling the die. The attributes of skills in a skill group are always the same. For example, if you want to make a social skill check, you always roll against Intuition, Charisma, and Charisma. It doesn’t matter whether you make a Seduction or Intimidate check. The number you roll on a D20 must be equal to or less than your rating in the attribute. You may use your skill rating (SR) to be successful with your check. Every skill and spell has its own SR, and you may use this rating to reduce rolls that are too high. For example, if a hero has an attribute rating of 12 and you roll a 14, use 2 points of your SR to reduce the roll. You cannot use the spent points for the remaining rolls of the skill check. If you have a SR of 10 and use 6 of those points with the first attribute roll, you only have 4 points left for the remaining rolls. You do not lose your SR points forever. If you have to make a skill check using the same skill later in the adventure, you have your full SR available again. If you use up all the points and cannot reduce the roll enough, the skill check is not successful. If you still have SR points, the number of points left determines the skill check’s quality level. Every three points remaining of your SR gives you one quality level (QL). The more QLs you have, the better your result. If you succeed in a check but have no points left, you have a QL of 1. Sometimes heroes must make a cumulative group check. This means that all players make a check using the skill and add all their QLs together. If player A has a QL of 2 and player B has a QL of 3, they together have a QL of 5 for the cumulative group check. In The Dark Eye, combats are divided into combat turns (CT). Every combat turn takes about 2–5 seconds, just the time needed to exchange blows or perform another action. Initiative (INI) determines the order in which the combatants can act. Initiative is decided for the entire combat and is not rolled anew each combat turn. The combatant with the highest Initiative can take his action first. If two combatants have the same Initiative result, both roll a D6. The one with the higher result can act first. In case of a draw, continue rolling until one combatant has a higher result. In each combat turn, every combatant may take an action, one or more defenses, and one free action, as follows. Roll a D20 to see if you’re successful with an attack or a defense. To succeed, your result must be equal to or less than your hero’s stat in Attack, Ranged Combat, Parry, or Dodge (you can find these ratings under Combat Techniques or your hero’s equipment). To attack an opponent in close combat, roll against your Attack (AT). If you use a ranged weapon, like a bow, roll against Ranged Combat (RC). If you defend, roll against your Defense Value. There are two ways to defend yourself: Parry (PA) with a melee weapon or Dodge (DO) to simply evade the attack. If an opponent succeeds with an attack, you may try to defend yourself. You can only dodge ranged attacks, not parry them. If you are attacked more than once in a combat turn, there is a penalty of 3 for each defense you make after the first. If your defense value drops to 0 or less, you can no longer defend during this combat turn. In the next combat turn, you may again use your full defense value. Ranged weapons have three Ranges (RA): short, medium, and long; which applies depends on where the target is. If the RA is medium, the roll is not modified. For short range, you get a bonus of 2 to your RC value, for long range you suffer a penalty of 2. Ranged weapons have a reload time. Some weapons require more than one action to reload. If an attack, a ranged attack, or a damage spell is successful and the target’s defense fails, the target is hit. Every weapon has a damage value, called Damage Points (DP). For example, 1D6+4 means that you roll one six-sided die and add 4 to the result to get the damage points. After rolling the DP, subtract the Protection (PRO) of the target from the total. If there are DP remaining, deduct them from the target’s life points (LP). If a creature’s life points drop to 0, it is dying. For heroes using magic there are some additional rules. Every spell costs a certain number of arcane points (ArP). When a character casts a spell, deduct the number from the spellcaster’s arcane pool. If the spell check fails, pay half the cost (rounded up). Casting a spell also costs a certain number of actions. After performing the last action needed for the spell, make your skill check. To cast a spell successfully, the target of the spell must remain in the spell’s range for the whole casting time. If the target moves outside the spell’s range, the spell fails. A spell’s duration may either depend on the QL, be sustained (by spending additional ArP as listed), or have an immediate effect. Fate Points (FaP) are a measure of a hero’s luck and the gods’ influence. FaP are the little bit of luck separating heroes from everyone else. How Can I Spend Fate Points? Reroll: To reroll one, two, or all three dice for a skill or an Attack, Defense, or Ranged Combat roll, you can spend 1 FaP. It doesn’t matter if you need to reroll one, two, or all three dice—you still spend only 1 FaP. You must make your roll before you use this option, to see if you botch the roll or something similar, and you must use the second result. You can spend only 1 FaP per check this way. Reroll Damage: By spending 1 FaP you can reroll 1D6 of damage. You may reroll only your damage roll, not your opponent’s roll. If your weapon inflicts more than 1D6 damage, you may only reroll one of those D6s, not two or more. Defense: To strengthen your defense in combat, you can spend 1 FaP and receive a bonus of 4 to all defenses until the end of the turn. This can be done anytime in the combat turn (but before rolling a Defense).